I used to have a lot of anxiety about entertaining. Having people over meant at least a day, if not two, of intense work and preparation. I don’t know if I read too much Martha, but a dinner party was a BIG DEAL. First there was planning a menu and shopping. Then I had to clean the house, including finding a hidden spot for the many, many piles of books and papers sitting around (Two lawyers in the family! Never trust a lawyer without piles of books and papers. We attract them like magnets.) Cooking an elaborate meal (meals to make in advance! 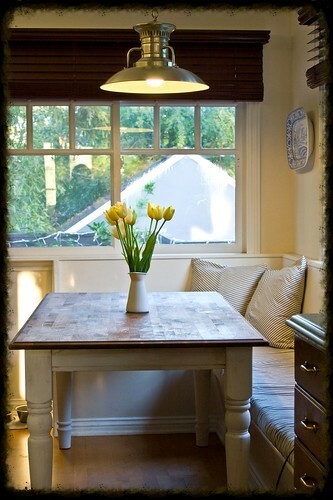 ), then scrubbing the kitchen, running and emptying the dishwasher (always start a dinner party with an empty dishwasher! Finally, we greeted the guests with a sparkling house, a set table, a tray of hors d’oeuvres, and utter exhaustion. Now, I don’t know if I’m wiser, or just older, and tireder, but I can’t deal with that kind of dinner party. I want to spend time with my friends, and not stress about it. I can’t bring myself to worry about whether or not they’re checking under the couch for dust bunnies. I haven’t caught anyone on their hands and knees yet, so I think we’re doing okay. And though I try to pick up the children’s toys — because have you ever stepped on a Lego in bare feet? OUCH. — I leave the piles of books and papers undisturbed. I don’t stress about cooking everything before the guests arrive, because, guess what? I have a kitchen, and it’s actually a pretty nice place to hang out. I know, because I do it all the time. 1) Comfortable seating. If you don’t have seating in your kitchen, guests can stand around, but chances are they’ll get in your way while you are cooking. We are lucky enough to have a banquette in our kitchen that can seat plenty of people, and I’ve added a farmhouse table that can go from work to dining surface without breaking a sweat. 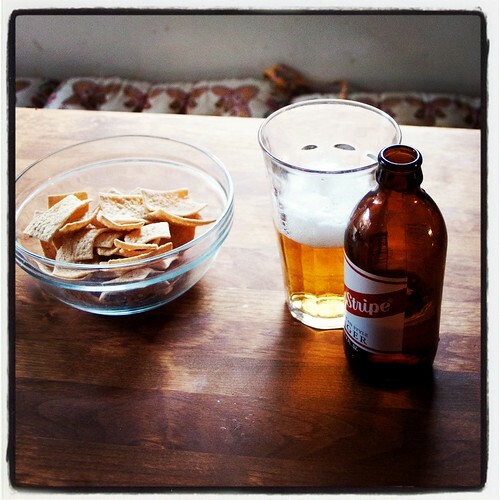 2) Mise en place. That’s a fancy French way of saying “plan ahead.” Know what you’re cooking ahead of time, know where your ingredients are and think through the steps. That way you can pay attention to the conversation as well as what you’re cooking, and your guests won’t have to watch you putting out fires- metaphorical or literal. 3) Drinks. Because if the bar is in the other room, nobody will keep you company in the kitchen. 4) Food. It all comes down to the food, right? I may have embraced low-stress entertaining, but I still want to feed people well. Kitchen entertaining lends itself well to food that guests can assemble themselves, or eat by the handful. 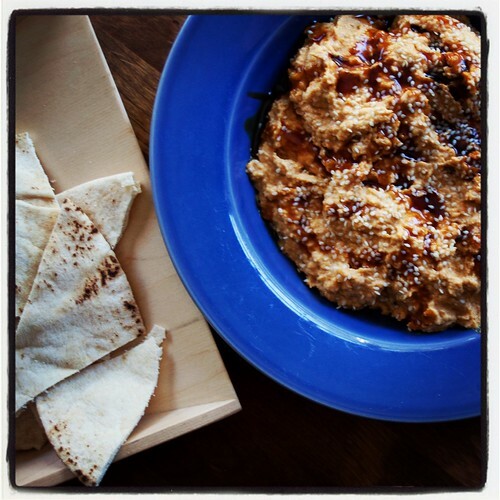 Think smoked almonds, Chex mix, cheese and crackers, or chips and dip. Instead of loading up a plate with appetizers that you have to eat standing up or take elsewhere, guests can sit at the kitchen table and munch on things bit by bit. Try a bowl of homemade hummus, some black eyed pea salsa, or these roasted red pepper and goat cheese canapes. One of my favorite appetizers for kitchen table entertaining is a bagna cauda. This butter, olive oil and anchovy dip, fragrant with herbs and garlic, is best served warm, right off the stove top. It can be messy, so it’s not great for a standing cocktail party, but it’s perfect to eat at the table, with lots of napkins. Best of all, it comes together in about 5 minutes, so you don’t have to stress about getting guests fed. 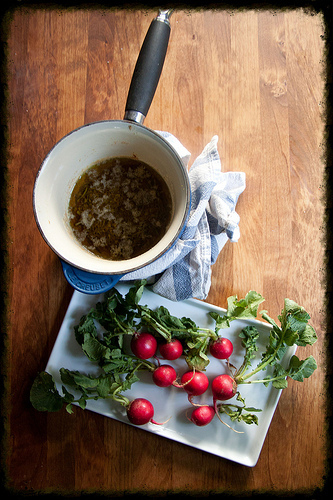 Many people eat bagna cauda with bread, but in our family, the dipping item of choice was always radishes, whose piquant crispness was a pleasant contrast to the rich saltiness of the warm bath. Best of all, you can dip and eat both the roots and the greens. Entertaining is a lot more low key these days. I can hang out in the kitchen, putting a salad together or chopping some vegetables, while my guests sit chatting at the kitchen table. I get my cooking done and my gossip time in, and everyone still eats well. In a small food chopper, combine anchovies (with their oil), garlic, and rosemary. Process until finely chopped. Add anchovy mixture to small saucepan with the oil, butter and lemon zest, and heat over low heat until the butter is melted and the flavors are infused. Serve warm with radishes for dipping. I actually really like entertaining. But – I don’t do it the way I used to. More often than not, it’s potluck style, and everyone brings something. Even if it’s just sparkling water. I leave toys out, books out, piles out. I may shove them aside, but they’re still out. When people come over, they tell me my house is very “lived in.” I used to think that was a nice way to say “cluttered,” and maybe it is, but it’s a pretty accurate word for how I’d describe my house. And I don’t care that there are dust bunnies. With two kids and three dogs, there will ALWAYS be dust bunnies!!! Ha! So I try to stay focused on the fact that the point is to see one another. Oh, and the food must be spectacular.